The Governor’s Suite at the Patrick Henry in downtown Roanoke, Virginia is the premier short-term accommodation for professionals and out of town guests. This 1 bedroom, 1.5 bathroom apartment is on the 2nd floor of the Patrick Henry building, overlooking the newly renovated Elmwood Park and historic Jefferson Street. With furnishings and details that are sure to impress, you’ll be pleased to call this spacious apartment “home” for your time in Roanoke. The Governor’s Suite has a full kitchen, king-size bed, a full and half bath. Governor's Suite Rental Rates: Rental Rate - Nightly (up to 2 nights) Rental Rate - Multi-night (3+ nights), Sunday - Thursday $175.00, $125.00. Fridays, Weekends and Holidays - $250.00, $200.00. Directions: From I-81, take Exit 143 to I-581 South. Take Exit 6 from I-581 to Elm Avenue/VA-24. Turn right on Elm Avenue and turn right on Jefferson Street - the Patrick Henry building is located on the left. Additional Information: 2 On-site Restaurants: Henry's Public House opening soon! Fall 2014 (lunch and dinner) Sarah's Place Cafe' is open for breakfast and lunch, Monday-Friday. Catering Description: On-site catering available, outside caterers allowed. 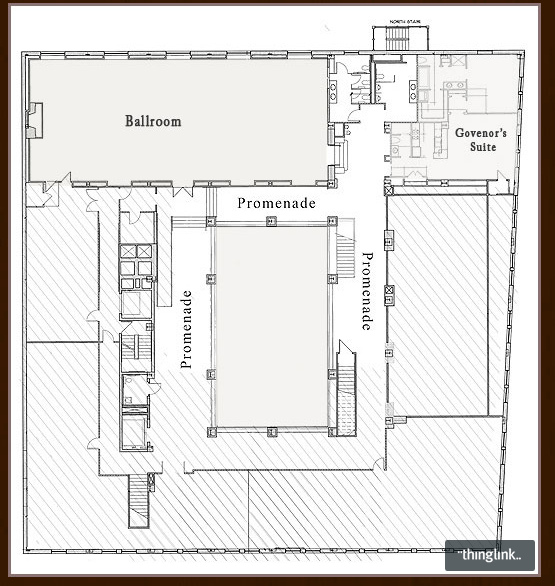 DescriptionThe Patrick Henry Ballroom consists of 3 event spaces: The Governor’s Suite, The Promenade, and The Grand Ballroom. We have a location for your every event need from intimate settings to large elegant spaces. Take a virtual tour today!